I’m not a huge breakfast eater, when I do decide to eat an actual meal before lunch, I’m always looking for savory, not sweet, options. Savory food at least starts to mimic the lunch experience, which I prefer. When I saw that Dunkin’ Donuts had introduced a Maple Sugar Bacon Breakfast Sandwich, I initially wasn’t interested in trying it. I’m not a huge fan of maple flavoring, and the name alone made it seem like the sandwich would veer too far into sweet territory. However, one morning I found myself at a Dunkin’ Donuts, hungry and with no prospect of lunch within the next few hours thanks to a fantasy hockey draft, so I decided to take the plunge and see if Dunkin’ could provide the maple sugar flavor without turning the sandwich into a sugar bomb. The Maple Sugar Bacon Breakfast Sandwich is “a double portion of sweet caramelized Maple Sugar Bacon, Egg and Cheese … on a freshly baked Croissant.” The price for the sandwich is $3.99 before tax and without any accompaniments. As an insight into my process here, when I order something, I want it as close to the advertisement as possible. If a company has created a product, I want to try what they’ve decided the public will want to eat, rather than order it with my own modifications. This is why I get annoyed with Subway, where I go in to order their promoted product, but I have to remember what’s on it because they don’t provide a default option. With that being said… I did not order the sandwich on a croissant. First, instead of defaulting to the croissant, the employee behind the counter gave me the option to choose my bread, which threw me off guard and let me to ordering the sandwich on a ciabatta roll. Second, I have eaten one croissant in my life which I actually enjoyed, and it was not from Dunkin’ Donuts. By ordering the roll instead of the croissant, I had more of a chance of enjoying the sandwich. I’ll keep my roll comments to a minimum since they aren’t necessarily relevant to the advertised product. Taking the sandwich out of the bag, I was struck by how small it was. I thought the roll would be bigger. It smelled great through. It had a strong maple and bacon aroma, and I couldn’t wait to begin eating. While the sandwich had a good amount of bacon coverage, my first bite managed to only have egg and cheese. The egg and cheese are standard Dunkin’ fare. They’re supporting players to the bacon, there more for added heft plus the slight melted cheese taste. I also think getting the roll was a better choice than sticking with the croissant. Though the sandwich was small, the roll was more substantial than a croissant would have been. The crust added a more of a crunch to the sandwich than a soft croissant. Also, as a breakfast sandwich, eating a butter-soaked croissant on top of bacon, egg, and cheese seems way too heavy for an AM meal. I ate this on a Saturday morning, and could imagine feeling sluggish and staying on the couch through the afternoon if I got the croissant. Eating this at work is incomprehensible if you wanted to be productive. The Maple Sugar Bacon had some pluses and minuses. It was crunchier than I anticipated, which can be a problem with fast food sandwiches. The taste was a mix between smoke and maple, skewed heavily towards the maple flavor. It seemed as if the bacon was soaked in maple and removed right before it was added to the sandwich. When eating the bacon alone, it was almost too sweet. As mentioned above, they didn’t skimp on the bacon. I sometimes hesitate ordering bacon breakfast sandwiches when compared with sausage, because a sausage patty is going to cover almost all of the sandwich, while a lot of places chose only give a few thin strips of bacon, making the sandwich feel light. Dunkin’ definitely chose to highlight the Maple Sugar Bacon and ensure it was a good portion. When eating all the components together, the sandwich was quite good. The smokiness of the bacon shone through and the sweet maple flavor was offset by the cheese. Even though I didn’t get much eggy taste, I think using it as another non-sweet element toned down the bacon to an acceptable level, keeping the sandwich as a nice balance between savory and sweet. Overall, the Maple Sugar Bacon Breakfast Sandwich was really good. I’m not a big breakfast sandwich guy, and I’m more likely to get a donut if I’m ordering food at Dunkin’, but for anyone in the mood for a breakfast sandwich, this is definitely worth a shot. It was filling, despite its size and just sweet enough to get that maple taste without tasting like candy. Of course, it’s worth noting that this was a seasonal offering, but I’m guessing it will return to the Dunkin’ menu sometime soon. After checking in on the Reese’s Peanut Butter Square, it’s time to continue Dunkin’ Donuts week with their Belgian Waffle Breakfast Sandwich. As someone who went through most of my life ignoring the fact that breakfast existed and only eating it when absolutely necessary, the revelation that a well-made and constructed breakfast sandwich is truly an amazing thing came to me later in life. While I still can find quibble with portions (there’s never enough bacon to justify ordering bacon as the meat instead of sausage and it’s amazing how many calories are packed into a reasonably sized sandwich), I look forward to any chance when I can eat a good breakfast sandwich (or burrito). When I saw that Dunkin’ Donuts had rolled out a waffle sandwich, it was only a matter of time before I gave it a shot. While the sticker on the door also showed a non-breakfast option with chicken*, I knew I’d be going breakfast on this one. *I have actually eaten a chicken patty from Dunkin’ Donuts. I would not advise others to do so. It’s not terrible, but because they don’t have a fryer in-house, it tastes like a frozen chicken patty that you decided to microwave instead of bake because who the hell has 45 minutes to bake a frozen chicken patty just so it can be crispy? The Dunkin’ Belgian Waffle Breakfast Sandwich contains “Cherrywood Smoked Bacon, American Cheese and Egg, between two delicious Belgian waffles.” The sandwich is priced at $3.99 on its own. It is available as a meal with your choice of beverage, but because there’s so much variation there, I didn’t write the price down. I got mine with a large iced coffee, pushing the cost over $7. When unwrapping the sandwich, I had two immediate impressions: 1) the sandwich was kinda small and 2) it smelled absolutely fantastic. Like better than McDonald’s hotcakes fantastic, and I think McDonald’s hotcakes (or do they call them pancakes now?) are probably the best smelling fast food. If they tasted half as good as they smelled, I’d eat them at least once a week. Anyway, back on topic, the sandwich smelled great. A sweet aroma, without being too sweet, with a hint of bacon. They could sell this as a cologne. People would buy it and be hungry all the time. Examining the sandwich… the waffle was floppy, which was disappointing. This comes back to my discussion of Dunkin’ chicken above: because they only have limited appliances with which to cook food, it’s tough to get things crispy. While I wouldn’t have wanted a super crispy waffle, it would have been nice if it had some resistance and maybe changed the texture of the sandwich, instead of relying solely on the bacon to do so. Floppiness aside, my first bite was pretty good. The waffle was very good, it had a sweet taste that was definitely satisfying. The egg certainly tasted real and I had no complaints. I did get bacon in that bite as well, but there wasn’t a lot of bacon on the sandwich. The bacon was thin, so you could get some porky smokiness, but the dominant flavor of the sandwich was the waffle, egg, and cheese. It had a good taste, but the sandwich really would have been better served with more bacon. Considering the size of the sandwich, they could probably have a sufficient amount by using two full slices and cutting/folding them to cover the whole interior. There’s no good reason why they couldn’t add more and keep it around the same price. As I continued eating, the cheese melted and adding some moisture to the sandwich, but I think it would have been better served with an actual sauce. I could see a little drizzle of syrup and/or some hot sauce really livening up the experience. The flavors would go well, and the sandwich wouldn’t be as dry. I would eat the Belgian Waffle Breakfast Sandwich if I was at Dunkin’ and smelled those damn waffles. Surprisingly, considering its size, I was satisfied after I finished. I ate around 11am and wound up skipping lunch that day, which I didn’t expect. I liked the egg, the waffle had a great taste and smell, and the bacon and cheese added just enough salt and texture to make this a win. I’d probably add my own syrup or hot sauce, but that’s an easy fix, and I’d rather add my own syrup than see the sandwich drenched in it. The only qualification is the price. I have a hard time seeing value in a sandwich and iced coffee costing over $7, but if that doesn’t bother you and/or you’re feeling particularly flush in the wallet, then I’d give this a shot. Oh boy, this is exciting. Usually, fast food restaurants use Columbus, Ohio and other middle America locations as test markets for new concepts. I don’t quite understand why, but I’m sure the marketing department says the demographics are favorable, or something like that. Sometimes that changes to California or New York if it’s more upmarket. But Boston never gets new products before they’re available to the general public, which is unfortunate because it would really help this blog (and pique my own personal interest) if we got to try products before they were available to the general public. 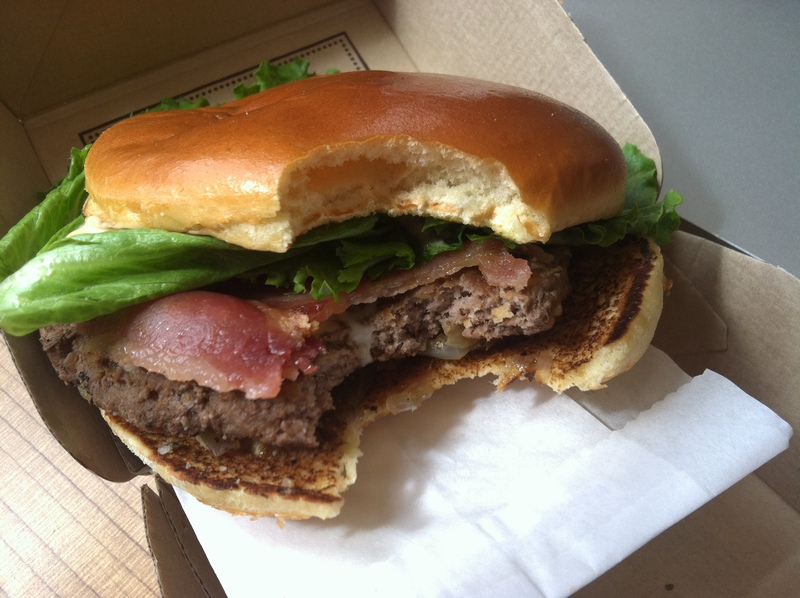 Well, today the fast food gods have smiled upon your humble author and Wendy’s is using Massachusetts and Tennessee as the test market for their Truffle Bacon Cheeseburger. I originally went to Wendy’s to try the new Grilled Chicken Sandwich, but as soon as I saw the large placard advertising the Truffle Bacon Cheeseburger, as well as Bacon Truffle Fries, I knew my true dinner destiny. I don’t have an official description of the burger since it is not listed on the Wendy’s site, but this article mentions the limited release as well the as the ingredients which are “a beef patty topped with mixed greens, Applewood smoked bacon, truffle aioli, Parmesan cheese sauce, tomato, and cheese” on “a buttery croissant bun.” A meal cost $7.09 and the burger alone was $4.99, so this isn’t cheap. The Bacon Truffle Fries were $2.29 as a side and were offered as an upgrade to a meal for an extra $0.75, which I thought was a great idea, and almost led to me ordering just the fries and getting that Grilled Chicken Sandwich, but of course I didn’t. The food came out pretty quickly and my first impression was that Wendy’s now puts burgers in boxes! Usually they come in that weird foil that always gets greasy (and I like Wendy’s burgers but they’re insanely greasy and come with mayo so I rarely eat them), but the box is a nice touch to keep it neat. The only problem with the box is that this sandwich is so big that I had a hard time picking it up because there wasn’t enough space for my fingers. I don’t have tiny hands, folks! After I figured out how to pick up the sandwich, I could examine it. The croissant looked flaky and smelled like butter, but wasn’t greasy or slippery, a huge bonus for someone who needs to use his phone to type notes as he eats. Thanks to Wendy’s for looking out for us fast food bloggers. Anyway, the croissant also had enough heft to it to stand up to the burger and not fall apart as I ate, which was a distinct fear of mine before I ordered. My first bite was weird. I don’t usually eat croissants and I definitely have never had a croissant burger, so the croissant taste/texture combined with beef was unfamiliar. My second bite was better as I got used to the beef and croissant combo, and I seemed to get all the ingredients. It tasted like a fancy bacon cheeseburger, and everything seemed to come together well. On its own, the Parmesan cheese sauce tasted like a Caesar dressing, which I can’t believe I’ve never had on a burger before. I’m guessing the truffle aioli was also represented in that taste, since I couldn’t see two distinct sauces, so I assume they were the same color. I don’t know what specific leaves actually composed the mixed greens, but I know they seemed like things I would normally put into a sandwich. They looked and tasted fresh and made the burger feel fancier. Usually fast food places don’t pay much attention to the lettuce, putting a crappy piece of Iceberg which doesn’t belong and tastes terrible, if it has a taste, on a sandwich. But the inclusion of these greens was a great choice especially if, as the linked article above mentions, Wendy’s is going for an upscale bistro burgerish vibe. The tomato also didn’t fall apart and added heft to the sandwich. I’ve now written more words on vegetables here than on every post on this site combined. Going back to the croissant, as mentioned before, it did not fall apart as I ate. I’m not usually a big fan of croissants, but it worked for me here. It was light enough that I didn’t feel gross eating which is essentially butter bread with a bacon cheeseburger. I’m not sure how people who like croissants would feel, but it worked for me. The beef patty itself is a generic Wendy’s burger. The beef is fine and well seasoned. The Applewood smoked bacon is also a standard Wendy’s feature at this point. The put a good amount of bacon on the burger, so almost every bite had some bacon. It had a good smoky taste and was cooked perfectly for me: it wasn’t burnt to a crisp, but also wasn’t floppy. The few bites without bacon definitely suffered from a lack of bacon. This is a limited item which may never see a wider release, but I hope it does. If the aim here was for an upscale pub style burger at a fast food price, I think they hit a home run. If you swapped out a Wendy’s patty for some high quality beef, I would absolutely pay $10+ for this burger. Every ingredient complemented each other and added to the experience. The burger just felt fresh and good. There are only two downsides that I saw. First, it was sloppy. Wendy’s burgers just can’t stay composed and by the end it was definitely messy and I was working to keep everything together. Second, this is a bacon cheeseburger on a damn croissant. It may as well come with a defibrillator. Adding on a small box of fries (plus some spicy chicken nuggets…), and I definitely needed to walk most of the way home after finishing my meal. But if you grab some extra napkins and plan a workout session, the Truffle Bacon Cheeseburger is definitely worth your time and stomach space if it appears near you. Finishing up Classic Connoisseur before I dive into some new eats, we’re going to talk about Checkers’ Bacon Roadhouse Burger. The Bacon Roadhouse Burger fits the current trend of jamming a lot of ingredients into a burger to make it stand out. While I tried this shortly after it had been released, it is still a regular part of the Checkers menu today. Checkers describes it as “double seasoned beef and cheese, crispy onion tanglers, BBQ sauce, and crispy bacon. Going in, I knew this thing was going to be fully loaded. Upon first glance, the burger actually looked like it’d be manageable. For all of its ingredients, it was packed well together. However, looking more closely, I realize that I’m going to be handling Texas Toast, which was not in the description! I understand the appeal of adding grilled buttery bread, but it makes the sandwich almost impossible to handle. It’s going to be slippery, hands are going to be extremely greasy, and I’m going to need a mountain of napkins to get through this thing. I also noticed mayo. There is no need for mayonnaise on this monstrosity. As mentioned before, I’m not rational when it comes to mayo, I actively dislike it. The Bacon Roadhouse already has BBQ sauce, and mayo doesn’t even fit the flavor profile of the burger. It’s just there to add calories. Digging in to the burger, the first bite tastes like the Rodeo Cheeseburger from Burger King, which makes sense since they share many of the same ingredients. Except Burger King doesn’t add mayo. The first ingredient to stand out was the onion tanglers. They were not fresh and tasted like they’d been under a heat lamp for a while. No real crunch, and they tasted overwhelmingly of onion, without any breading or seasoning. Luckily, the BBQ sauce was more of a dominant flavor. It was tangy and luckily not too sweet. It would have been fine to use this on its own to dress the burger, and not use any mayo. The burger itself was also pretty good! It actually tasted like beef and wasn’t just a filler to deliver the toppings. Between the good burger and not gross cheese, I’d be fine eating a regular cheeseburger at Checkers. I also really liked their bacon. It was crispy and salty and smoky and really added to the burger. 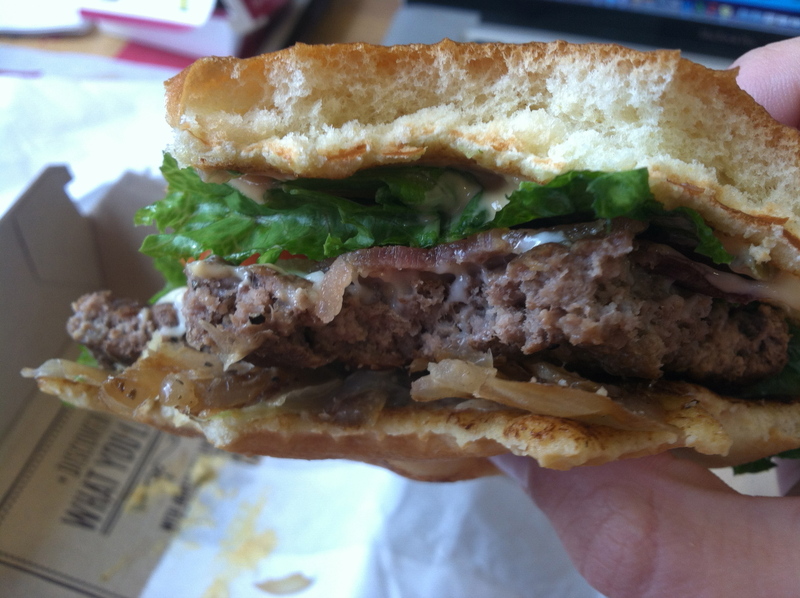 At this point, I should note that the burger itself was sloppily put together, so I was having a hard time getting a bite with all the ingredients. 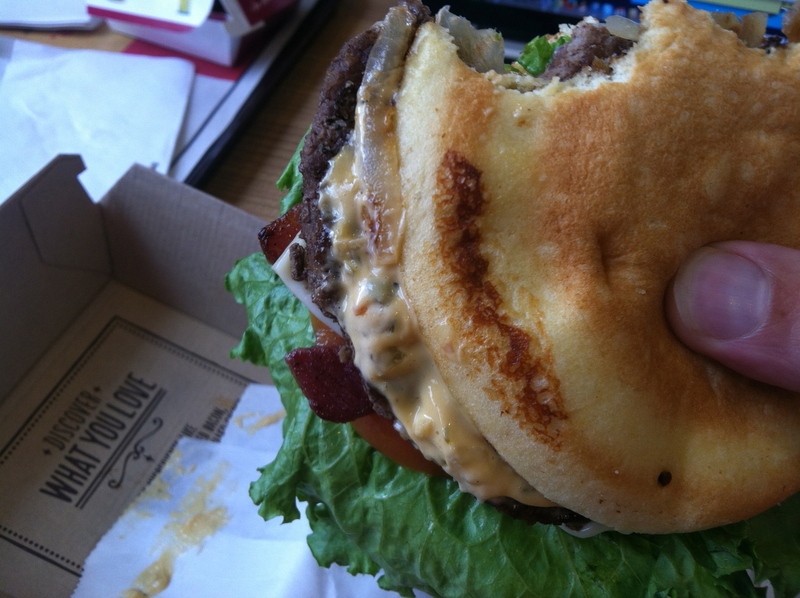 I should also mention that the burger was incredibly greasy, almost to the point of being a turn off. Eating outside in humid weather was not helping. 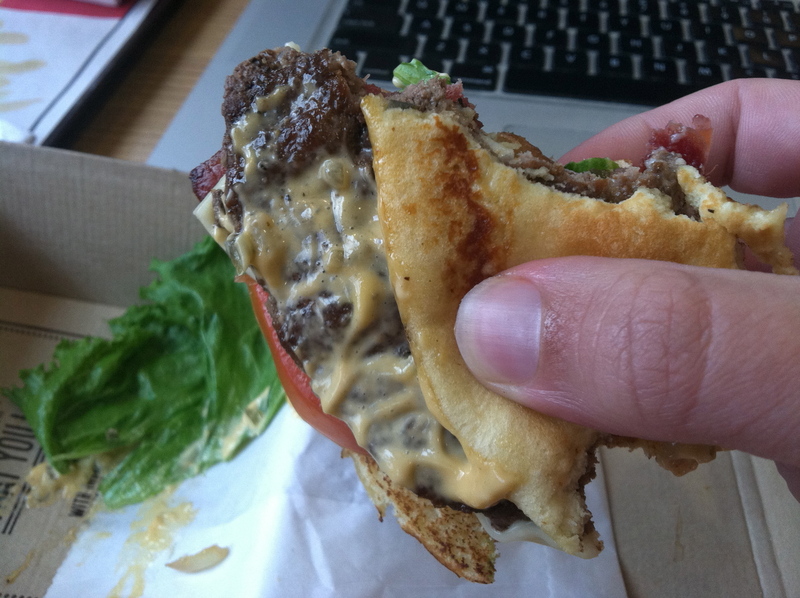 The burger was also falling out of the Texas Toast, which I felt detracted from the sandwich. I didn’t think it added enough flavor to make up for its slipperiness and likely addition of several hundred calories. A regular bun would have been fine and made the burger easier to handle. When I finally got a bite with everything, onion tanglers aside, it was quite good! The problem was I got too few bites like that. Overall, the Bacon Roadhouse Burger has some serious potential and is something I’d consider ordering again. Topping a cheeseburger with bacon, BBQ sauce, and onion rings/tanglers is hard to screw up, and Checkers did a pretty good job here. I’d prefer this with a regular bun and no mayo, and would probably specialize my order in the future to make the eating experience better. Also, better execution from the kitchen in properly putting it together and using fresh onion rings would bump this up a few notches. Note: I have now started and stopped this post three times (as you can tell by the lack of updates here). Not sure why this sandwich was so uninspiring, but I apologize for this post and it’s disjointed nature. 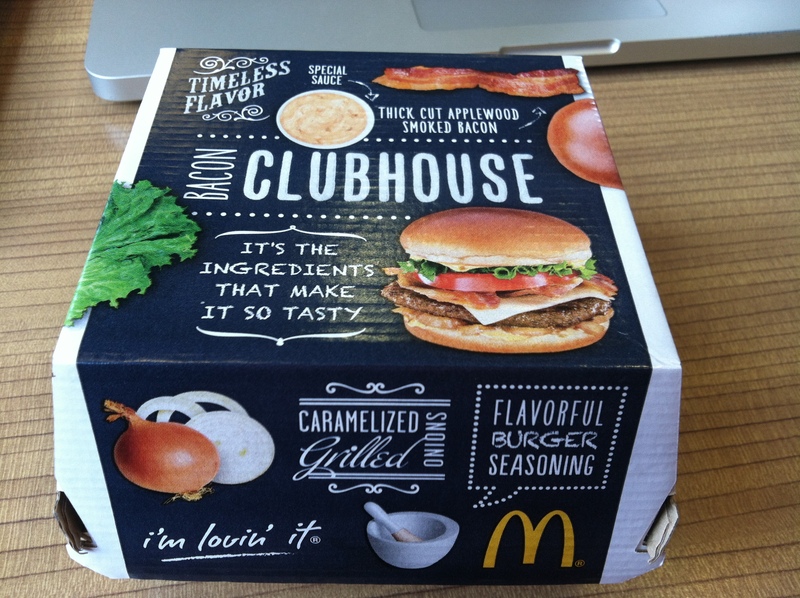 I originally ate McDonald’s Bacon Clubhouse before Taco Bell’s breakfast menu had been revealed. However, due to reasons, the post got pushed back. Luckily, McDonald’s is still advertising this as a new sandwich. This would be strange for most places, but considering that most new McDonald’s items consist of slapping together existing ingredients and adding one flourish to make it unique, I guess I shouldn’t be surprised. This is not to say that I don’t like McDonald’s; it’s just that as the market leader, they aren’t innovative (except in areas where they’re making drinks), but their interest to challenge Starbucks and Dunkin’ Donuts doesn’t particularly interest me. Enough of my McDonald’s thoughts, let’s actually discuss the sandwich and the experience, alright? This was a new McDonald’s, as the company seems to be trying to move away from their bright red and yellow past into something more modern and apt to attract people who don’t want to eat in a place that looks like a clown show. This is good, I guess? I like free wifi. Anyway, I ordered a medium meal and it cost $7.19 pre tax. A little on the expensive side, or at least it seems like it was expensive. (As a quick diversion, I used to work at McDonald’s, so paying for anything there is still a shock to the system, even though I stopped working there around 10 years ago). The food took around 5 minutes to come out. The sandwich was presented in a nice box, which a paper wrap around the sandwich to help with lifting. The paper was actually a nice touch here since the sandwich took up most of the box, so there was no way to pick it up without getting my hands messy and shuffling ingredients in the burger. 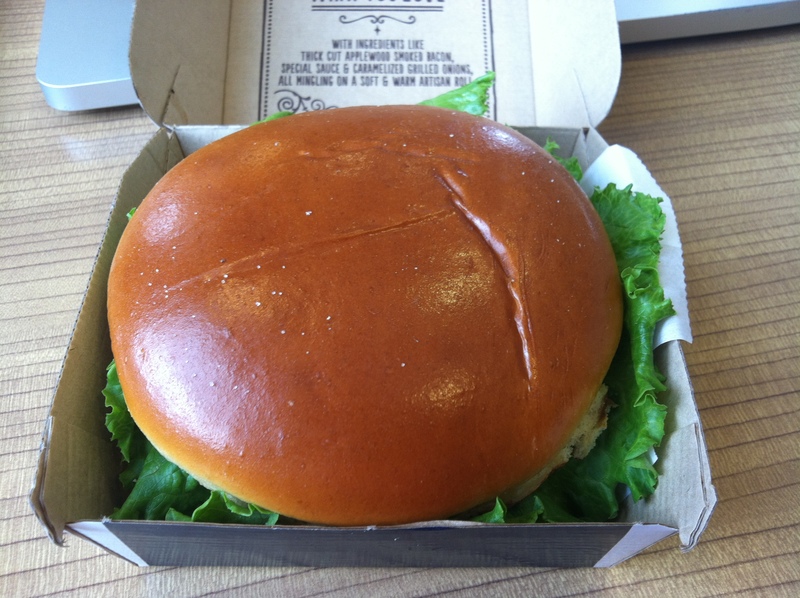 Since it was big compared to the box, my first view was of the bun, which looked fancy. Or at least nicer than the usual sesame seed bun. It also smelled damn good, but that’s because all I smelled was bacon. 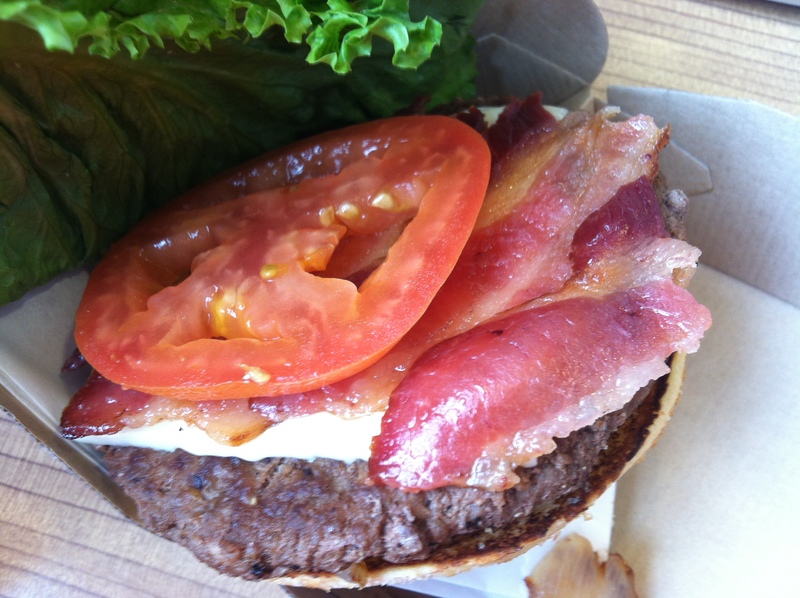 Quick tip for fast food restaurants: regardless of the quality of your bacon, it always smells good. Make your establishments smell like that. The Bacon Clubhouse Burger is “[t]hick-cut Applewood smoked bacon, carmelized grilled onions, white cheddar, crisp leaf lettuce and fresh tomato, all lovingly layered on a quarter pound of 100% pure beef, then topped with Big Mac special sauce. Served on [an] artisan roll.” So what we have here is flowery language for a fancy Quarter Pounder with some Big Mac sauce. An updated Big N Tasty, if you will. I tried to pick this up and, once again, I thanked them for that paper wrap around the burger, because it was already slipping and sliding. This is going to be messy. My first bite was dominated by bacon. I got a good chunk in there, plus the smell. After I got beyond the bacon though, this was dry. The artisan bun was not doing it’s job as it was actually detracting from the experience with its dryness. It looked nice, but that’s the nicest thing I can say about it. When sampled alone it was buttery and reminded me of potato bread, but it didn’t work here. Going beyond the bun, I got a bit of the grilled carmelized onions. I generally hate onions, and this is really the only preparation where I find them tolerable. I have to say, they weren’t too bad. The onion flavor was a bit strong for my liking, but they did a good job with these. My second bite was salty, as the bacon overtook the dry bun and asserted its dominance in the sandwich. I got a taste of the cheddar here, and it seemed to be a strong American cheese. It did its job in providing an accent, without overpowering anything. The Big Mac sauce was a welcome addition. I like McDonald’s utilizing it on more sandwiches. It tastes good, and sometimes I want it, but don’t feel like fighting through all the bread on the Big Mac, nor do I want to make a special order. Having another sandwich with the option is great. As I continued eating, the burger became really salty. Not sure if that was just because of the bacon, but I found myself repeatedly going to my soda to alleviate the salty taste. When I finally got all the sandwich components in one bite, the bacon and Big Mac Sauce saved the day. They are the two standouts here, and if you’re ordering this sandwich, those are the flavors that you really want to shine anyway. The onions added a good crunch, but the flavor was lost in this bite. The problem with the sauce is how they slathered it on the sandwich. It’s on both the top and bottom buns, which is why the sandwich is so slippery and I was having a hard time holding it. In addition, because I had to guard against sauce squirting out at two different spots, this was messy. The burger was a letdown. While McDonald’s doesn’t have the juiciest or best tasting burgers, they’re generally well seasoned and taste like beef. I did not get that here. It was just a dry wad in the middle of my sandwich. The bacon itself smelled like heaven. 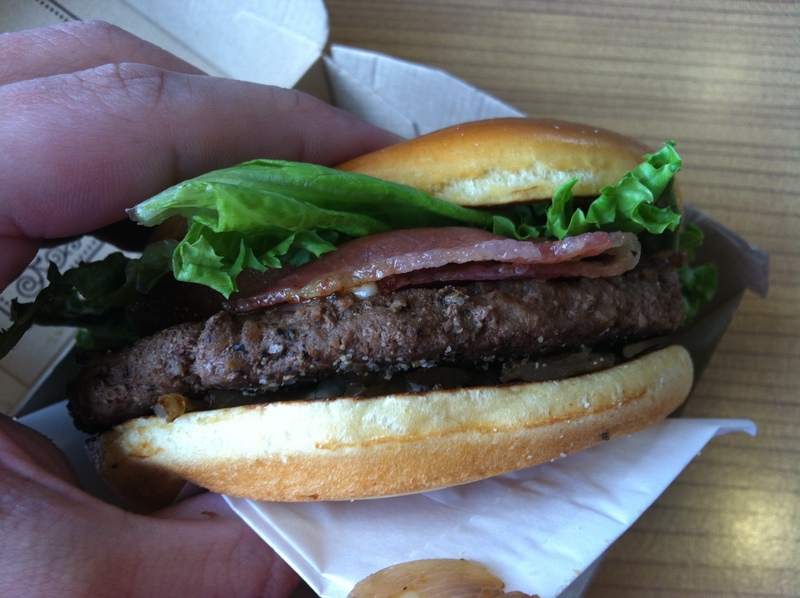 It was a little overdone for my taste, but that’s generally how McDonald’s makes its bacon. The lettuce at least looked fresh, but there was way too much of it. It was falling out of the sandwich, and of course sauce was in all the crevices. I had to take some off so I could continue eating. I have no notes on the tomato, which at least means it wasn’t terrible and needed to be taken off. So what do we really have here? A salty, over sauced sandwich that serves as a delivery vehicle for bacon and Big Mac sauce, and is really messy. That’s not necessarily a bad thing… but it’s also not making me run out to McDonald’s to eat this again. And with the luxury of eating this when it first came out, and writing this in December, I can say that I’ve been to McDonald’s probably an average of once a month since then, and have never thought of eating this again. That’s the problem with McDonald’s: the new items, at least in the traditional fast food category aren’t particularly exciting. They’re #1 and don’t need to take any chances, so instead we sandwiches that have small tweaks on the margins (New sauce! Bacon! ), but don’t really change anything. This is a perfectly cromulent burger, but that’s all I can honestly say about it.